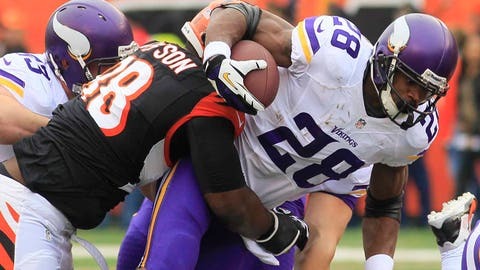 Minnesota Vikings running back Adrian Peterson (right) is tackled by Cincinnati Bengals defensive tackle Brandon Thompson in the first half. CINCINNATI (AP) — Three seasons in the NFL, three times in the playoffs. Andy Dalton has done something special during his just-getting-started career. Now he gets another chance to win one when it matters most. 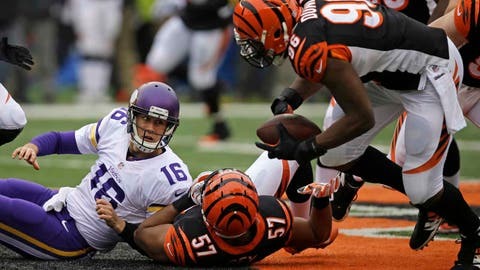 Dalton threw four touchdown passes on Sunday, linebacker Vincent Rey returned an interception 25 yards for a score and the Bengals had another big day at home, beating the Minnesota Vikings 42-14 on Sunday. A few minutes after their game ended, the Bengals (10-5) clinched a playoff berth when Miami lost at Buffalo 19-0. That made it 3-for-3 for Dalton, who will be in the spotlight more than anyone else at playoff time. It’s the first time in their history that the Bengals have reached the playoffs in three straight seasons. "To be in the playoffs every year since I’ve been here is huge," said Dalton, only the fifth quarterback in NFL history to make the playoffs in each of his first three seasons. "It gives you a chance to accomplish the ultimate goal." Something about Paul Brown Stadium brings out the best in Dalton and the Bengals, who are 7-0 at home. They’ve topped 40 points in each of their past four home games, a franchise first. Dalton has thrown for five, three, three and four TDs in those games. "He was really grooving out there today," said A.J. Green, who caught two of the touchdowns. "We got everybody involved today." The Vikings (4-10-1) had knocked off playoff contenders Chicago and Philadelphia in the past three weeks. Even with Adrian Peterson back from a foot injury, they couldn’t keep up. The Vikings had allowed the second-most points in the league heading into the game. They gave up 40 for the third time this season. Two of Cincinnati’s touchdowns came off their defense. 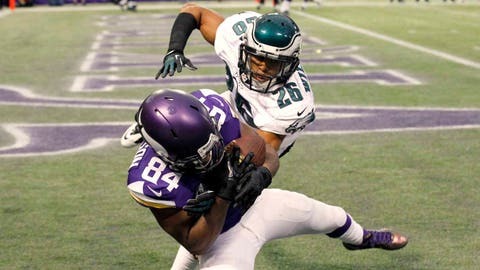 "Turnovers definitely decided the game," said Peterson, who sat out the second half with the Vikings far behind. "We put them in a position to play the game the way they wanted to play. "It’s tough getting behind the 8-ball like we did." Dalton has thrown 31 touchdown passes this season, one shy of Carson Palmer’s club record from 2005. Dalton replaced Palmer in the 2011 season and has led the Bengals’ surge. His biggest shortcoming: 0-2 with two poor showings in the playoffs. The Bengals haven’t won a playoff game since the 1990 season, tied for the seventh-longest stretch of futility in NFL history. Dalton had good conditions for throwing the ball — breezy with temperatures in the 50s. And the defense helped out, too. Dalton threw touchdown passes of 29 yards to Green and 16 yards to Jermaine Gresham as the Bengals pulled ahead 28-7 before halftime, the most points that Minnesota had allowed in an opening half. Two of Cincinnati’s first three touchdowns came courtesy of the defense. Rey’s interception and touchdown return made it 21-7. Giovani Bernard pulled off the game’s flashiest play, turning a short pass into a 41-yard play in the third quarter by doing a complete spin to avoid a tackler, stiff-arming another and reaching the 7-yard line. Dalton passed to Mohamed Sanu for his third touchdown. Green made a one-hand grab of a 2-yard pass for another TD. Peterson returned after missing a game with a sprained right foot. He got the ball on Minnesota’s first two plays and gained only 4 yards. On third down, Cassel was sacked on a blitz and fumbled. End Carlos Dunlap picked up the ball and returned it to the 4-yard line. Two plays and 12 seconds later, BenJarvus Green-Ellis ran it in for a 7-0 lead. Peterson was limited to 45 yards on 11 carries. Cassel was 13 of 27 for 114 yards with one touchdown and three interceptions. The Vikings took advantage of Dre Kirkpatrick for their first touchdown — the cornerback played off Jarius Wright, went for a fake and stumbled, allowing the receiver to run past him for a 36-yard score. Notes: Pat Haden of the Rams, Dan Marino of the Dolphins, Bernie Kosar of the Browns and Joe Flacco of the Ravens are the other four QBs to lead their teams to the playoffs in each of their first three seasons. . . . The Vikings were 0 for 9 on third down and 0 for 2 on fourth down. . . . Minnesota managed only 209 total yards, its second-lowest total of the season. . . . Bengals TE Tyler Eifert sat out the second half with a pinched nerve in his neck.